Sydney, Brisbane, Gold Coast + AU WIDE! Looking for Hospitality or Retail Staff? 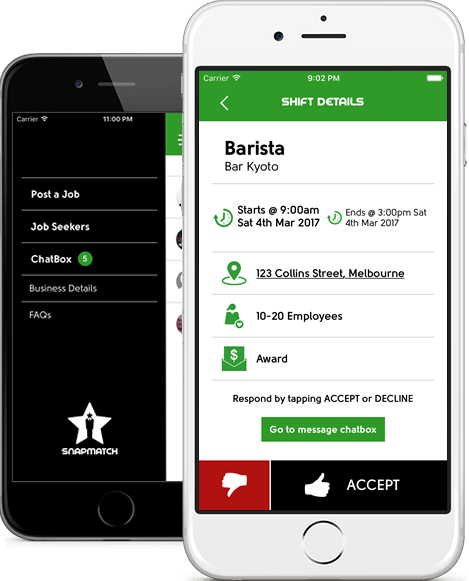 SnapMatch instantly connects cafe, barista, bar and retail staff with jobs! Stop wasting your time, find staff now or let the jobs find you! Part time Jobs Melbourne, Sydney, Brisbane, Gold Coast — Part-time, Casual, Temp Staff & Jobs — Australia wide! Employers post your part-time, casual & temporary job requirements and SnapMatch will instantly provide you with suitable job seekers. Job Seekers are matched on their skills, experience, availability and location. Employers; to get started sign-up for an employer account below. Job Seekers create a free personal SnapMatch profile letting SnapMatch and employers know when you require work. You will receive job offers that match your skills and availability. Job Seekers; to get started download our app on your iOS or Android device and create a job seeker profile. SnapMatch is continually working for you finding you a job or an employee. 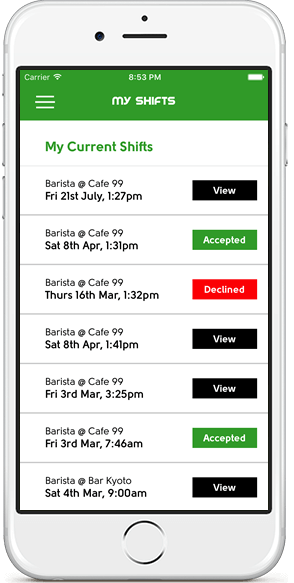 SnapMatch will make managing a shift roster easy, confirming availability and acceptance in seconds. employee data such as banking/super details via our secure web app. your weekly shift roster and even reminds you when to start. Are you an employer? Post unlimited jobs, match & hire unlimited job seekers; learn more or watch our demo video. FREE TRIAL: Employers use the 'SMJOBS' promo code for a 30 day FREE trial. (Trial has 1 user and can be canceled anytime via your employer login after sign-up). SnapMatch is FREE for Job Seekers. pricing that will meet your requirements. Part-time, Casual & Temporary Jobs in Melbourne, Sydney, Brisbane, Gold Coast, Perth, Adelaide & Australia wide. Employers only can request a demo of SnapMatch. Job Seekers SnapMatch is free for you; download our app and create a job seeker profile to get started!